1. Digital Printing: The printer uses thousands of tiny ink dots to form letters and designs on the paper. This type of printing is most commonly used for smooth or lightly textured papers. It is the fastest and most economical way of invitation printing. 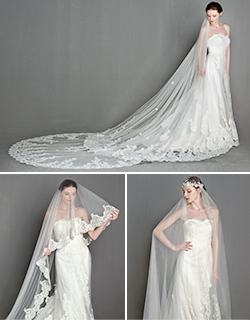 This process is ideal for more casual or funky wedding styles and for couples who are on a tight timeline or budget. Pros: No limits on colors/patterns. Fast turn-around time. Cons: No texture in the printing. The end result doesn’t look expensive. Notes: People confuse Digital with Offset printing. 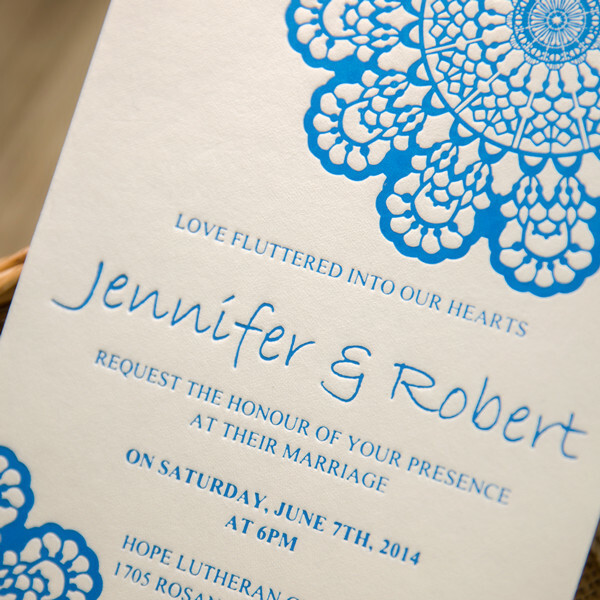 Offset printing is not a common technique for wedding stationery because it’s normally done in large invitation quantities (500 or more) and not appropriate for smaller quantity needs. 2. Thermography: If you want the look of engraved printing but can’t afford it, then this method is a less costly but close to the real thing. 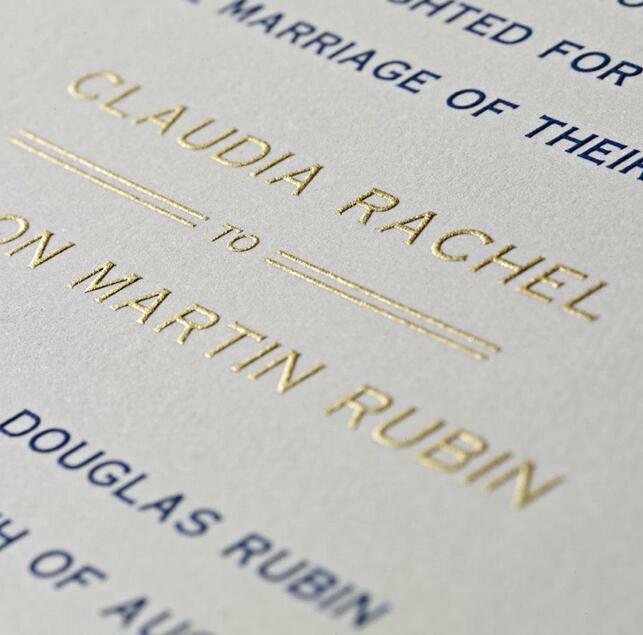 If an invitation looks engraved but the paper behind the printing is smooth, you have thermographic printing. Many brides love this technique because it offers a raised texture that is affordable and can’t be done with a home printer. Pros: Affordable for a high-end look. Provides a raised texture so guests know your printing was done with a professional. Cons: Ink can look glossy. Colors cannot overlap. 3. UV Printing: This type of printing is the new technique from Elegant Wedding Invites. UV printing is similar to the Thermography but allows ALL the printed colors to have a raised texture and blend seamlessly. You can name it as the full color Thermography, but the prices are almost the same as general Thermography, so UV printing option is truly cool and endless with options. Pros: Affordable for a high-end look. All colors can blend together and still have texture. Cons: Ink can look glossy. There are limits on some complex designs/patterns. 4. Letterpress: The letters are indented on the front and slightly raised on the back of the invite. Letterpress is the most traditional style for wedding stationery in the USA, but it isn’t commonly purchased because it is so expensive. Pros: The texture cannot be replicated with any other technique, so you’ll love the way it looks/feels. Cons: High in price. Limited paper choices because Letterpress requires a certain thickness. Limited amount of ink colors. 5. Engraving: This technique is featured with letters that are raised on the front and indented on the back of the invite. 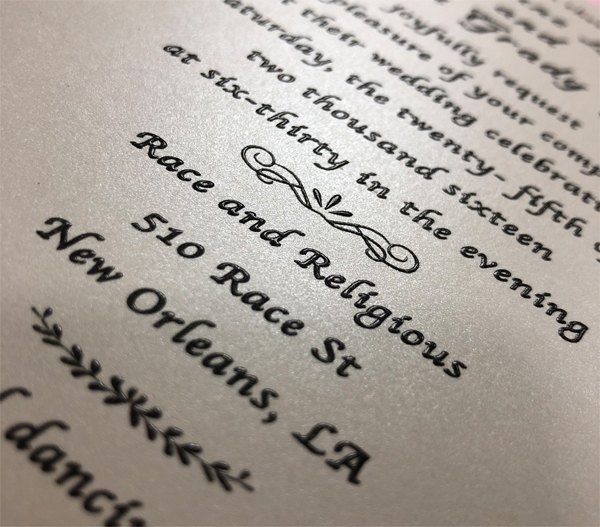 This technique costs about the same as Letterpress, and brides much prefer Letterpress to Engraving as it doesn’t offer the extreme indentation that Letterpress does. Pros: Traditional look with great texture. Cons: High in price. Fewer options for customization. 6. Foil Stamping: Foil is a great way to add some pizazz to any wedding stationery. Foil stamping complements a luxury, romantic wedding, but it’s also become increasingly popular for whimsical and casual invites with paper that has an indentation from the foil imprinting. 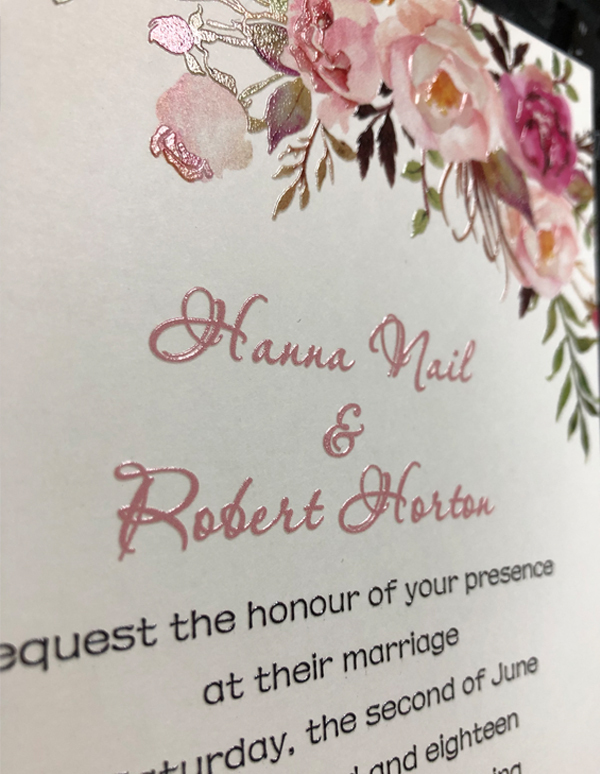 Brides usually prefer to use Foil on special words (names/locations/cards titles) and will choose another technique for the all other wording to truly make the Foil stand out and feel special. Pros: Creates a shine no other printing technique can match. Cons: Somewhat expensive. Very limited colors. Limits on what other techniques can be used with foil printing. 7. Laser Cut: Laser Cut isn’t a printing technique, but rather an additional detail to the paper itself. A laser beam cuts intricate patterns/shapes into the paper leaving a lace-like effect. This can be done to create patterns, cut shapes, or the actual wording itself can be cut into the paper. Think of Laser Cut as carving, but the carve goes all the way through the paper. Pros: Very intricate patterns can be created. Cons: Somewhat expensive. Too much pattern for some brides. Sometimes burn marks on lighter colored papers can happen because of the high heat of the laser beam. This entry was posted in Wedding invitation tips and tagged wedding invitation ideas, wedding invitation printing, wedding invitation tips. Bookmark the permalink.